Built by Palmer's Shipbuilding & Iron Company, Jarrow-on-Tyne, England, 1899. 9,203 gross tons; 470 (bp) feet long; 56 feet wide. Steam triple expansion engines, twin screw. Service speed 12.5 knots. Accommodation for 70-1st and 2,200-3rd class passengers. Built for British Shipowners Limited, British flag, she was launched on 21st Oct. 1899 and named British Prince. She sailed for the Phoenix Line between Antwerp and New York as a cargo ship. 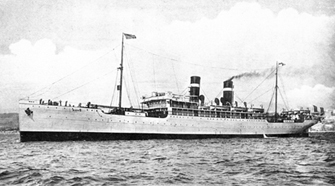 Sold to Navigazione Generale Itlaliana Line, Italian flag, in 1906 and renamed Sannio. She was fitted with passenger accommodation and started her first Genoa - Naples - Palermo - New York voyage on 31st May 1906. Her last sailing on this service started on 1st Apr. 1911, and in January 1913 she came under the control of Italia Line and was renamed NAPOLI. She started her first voyage from Genoa to Naples, New York and Philadelphia on 28th Mar. 1913, and her first Genoa - Palermo - Naples - Halifax - Boston sailing on 18th Aug. 1913. In 1917 she was acquired by Transoceanica of Naples and on 4th Jul. 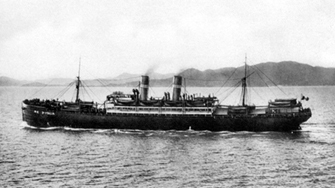 1918 was sunk in collision with the Norwegian ship OTTO off Genoa on July 8, 1918. Built by Forges et Chantiers de la Mediterranee, La Seyne, France, 1902. 5,291 gross tons; 426 (bp) feet long; 46 feet wide. Steam triple expansion engines, twin screw. Service speed 14 knots. Accommodations for 1,454 passengers (54 first class, 1,400 third class). Built for Fabre Line, French flag, in 1902 and named Roma. Mediterranean-New York service. Scrapped in France in 1928. 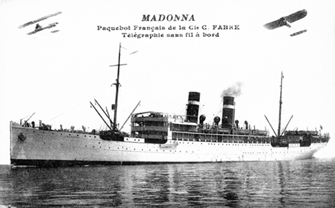 The "Madonna" was built by Swan, Hunter & Wigham Richardson, Wallsend on Tyne in 1905 for the Fabre Line of Marseilles. She was a 5,537 gross ton ship, length 430.9 ft x beam 48 ft, two funnels, two masts, twin screw and a speed of 16 knots. There was accommodation for 54-1st and 1,650-3rd class passengers. Launched on 1/23/1905, she sailed from Marseilles on her maiden voyage to Naples and New York on 4/29/1905. She sailed under the British flag until 6/17/1906 when she left Marseilles under the French flag bound for Naples and New York. In 1912, accommodation for 60-2nd class passengers was added. On 5/30/1919 she commenced her first voyage after the Armistice, from Marseilles to Oran and New York with cabin and 3rd class passengers. 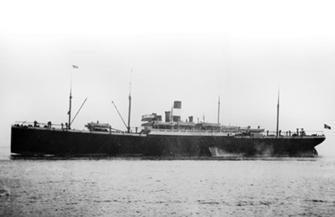 On 3/10/1925 she commenced her last transatlantic voyage between Constantinople, Piraeus, Leghorn, New York and Marseilles, and from 1927 onwards was used on the West Africa service. She was scrapped in Italy in May 1934. The Luisiana (1906) Lloyd Italiano - Built by Soc. Esercizio Bacini Riva Trigoso, Italy. Tonnage: 4,983. Dimensions: 393' x 48'. Twin-screw 141/2 knots. Triple expansions engines. Two mast and two funnels. Commenced Genoa-New York service April 1906. She also served in Italy-South America trade. Made her final voyage to New York in 1913. Sunk near Almeria in February 1917, while on voyage from Buenos Aires to Genoa. The "Regina d'Italia" was a 6,560 gross ton ship, built by Sir J.Laing & Sons Ltd, Sunderland (engines by G. Clark Ltd, Sunderland) in 1907. Her details were - length 430 ft x beam 52.7 ft, two funnels, two masts, twin screw and a speed of 14 knots. There was accommodation for 120-1st and 1,900-3rd class passengers. Originally laid down as the "Sardinian Prince" for the British owned Prince Line, she was purchased on the stocks by Lloyd Sabaudo and launched on 20th Jan. 1907 as the "Regina d'Italia. She sailed on her maiden voyage from Genoa to Naples, Palermo and New York on 15th May 1907, made two Genoa - South America voyages the same year and in Dec. 1908 she was used as a hospital ship after the Messina earthquake. She continued New York sailing's during the Great War up until the end of 1916 when regular passenger voyages on this route were discontinued by the company. On 10th Apr. 1919, she resumed N. Atlantic sailing's when she left Genoa for Marseilles and New York and in 1920 was refitted to carry 2nd and 3rd class passengers only. On 20th Jan. 1920 she arrived at New York from Constanza, Constantinople, Smyrna, Piraeus and Messina and started her last Genoa-Naples-Boston-New York voyage on 14th Mar. 1922. In Apr. 1922 she transferred to the Genoa - South America service, except for a single round voyage between Genoa, Naples, Palermo, Halifax and New York commencing 22nd May 1924. In Oct. 1928 she was scrapped in Italy.